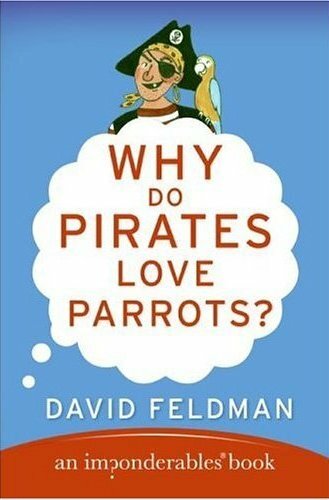 Dave Feldman’s Why Do Pirates Love Parrots? arrives November 4, his tenth book of Imponderables. While I believe my best File 770 posts come from thinking up interesting questions then finding the answers, Dave has taken the concept much farther and gotten a whole line of books out of it. Why can’t you buy grape ice cream? Why can’t you buy bagel holes? Why do motorcyclists rev their engines at stoplights? This entry was posted in Like Show Business and tagged David Feldman, popular culture by Mike Glyer. Bookmark the permalink. Who says you can’t buy grape ice cream? I remember seeing it in the stores years ago … thank gawd it seems to have disappeared, though. It was squeezed out of the market by peach-praline, green tea, blueberry yogurt, chocolate banana and other more sophisticated flavours. That grape flavour never tasted like grapes to me at all — more like you’d imagine old ink pads for rubber stamps. Helmets: you could have banged your head before you finished the mission. I’m recalling off hand because my wife rides a cycle: that on very very cold days you rev up a cycle to keep the engine warm enough to continue moving. If you don’t, it has to be restarted. This is not good when traffic may start to move without your being in the flow. SF fandom impoderables: why do science fiction fans dress so strangely?